most common focus. It can be observed in religion, philosophy, spirituality and psychotherapy as well. ferent parts into a larger whole” or “including into a whole”. the course of an illness. H. J. R. HOENDERS ET AL. medicine (Chung, Hillier, Lau, Wong, Yeoh, & Griffiths, 2011). CAM (Hirschkorn & Bourgeault, 2005). history of mankind in all types of fields and all sorts of ways. thinking and act i ng. 2005; Scannell, Allen & Burton, 2002; Steger & Frazier, 2005). ing from it (Oguamanam, 2006). tension between health needs and supply. character (Korrelboom & Ten Broeke, 2004). are many developments with a tendency towards integration. particular situation, cannot always be generalised to a group. 2006). This calls for an integrated research approach. did not lead to absolute, unquestionable truths. vive, it will have to make sure that the balance is not lost. crisis and fraud in scientific research. ess of differentiation, he may fear that integration will destroy it. sistance in preparing the manuscript. het werken aan verandering]. Amsterdam: Boom. and Clinical Psychology, 65, 842- 852. Hong Kong. Social Science & Medicine, 72, 247-255. Consortium, T. (2009). URL (last checked 1 February 2012). Journal of Australia, 180, 587-589.
tive interventions. Social Science & Medicine, 70, 71-79. United States, 1990-1997. JAMA, 280, 1569-1575.
metto, and Kava. 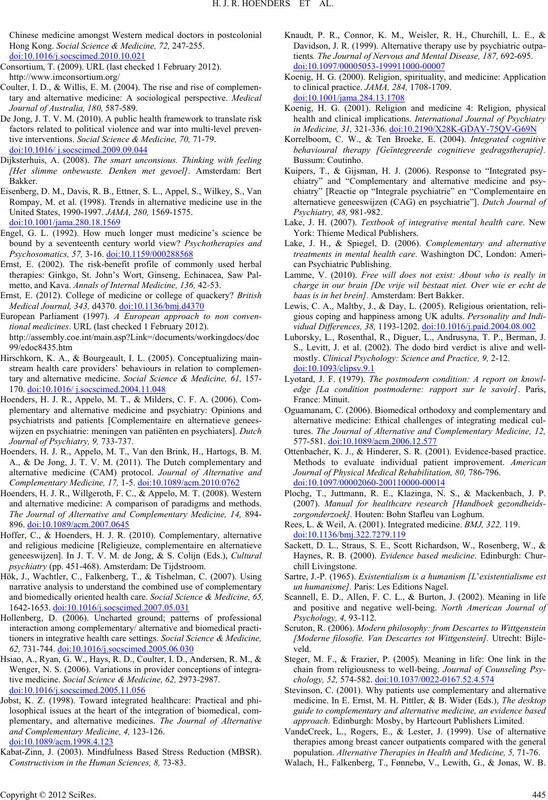 Annals of Internal Me di cin e, 136, 42-53.
tional medicines. URL (last checked 1 February 2012). Journal of Psychiatry, 9 , 733-737. 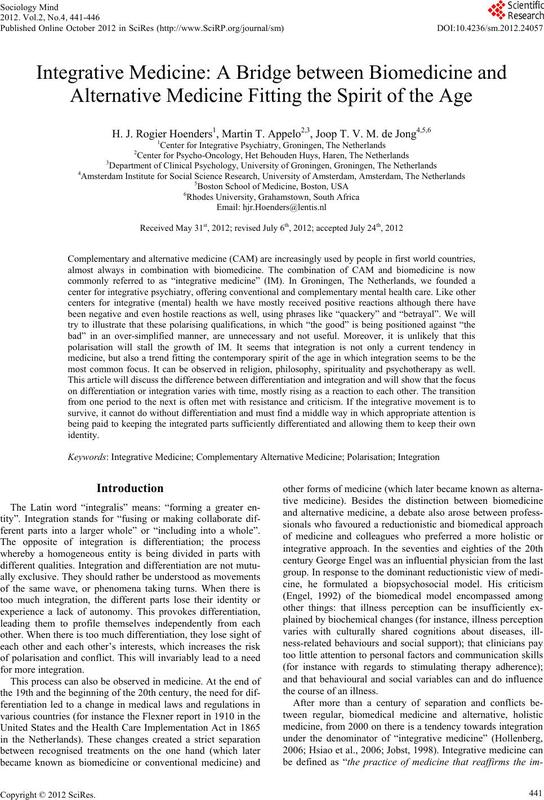 Hoenders, H. J. R., Appelo, M. T., Van den Brink, H., Hartogs, B. M.
and alternative medicine: A comparison of paradigms and methods. psychiatry (pp. 451-468). Amsterdam: De T ijds troom. tive medicine. 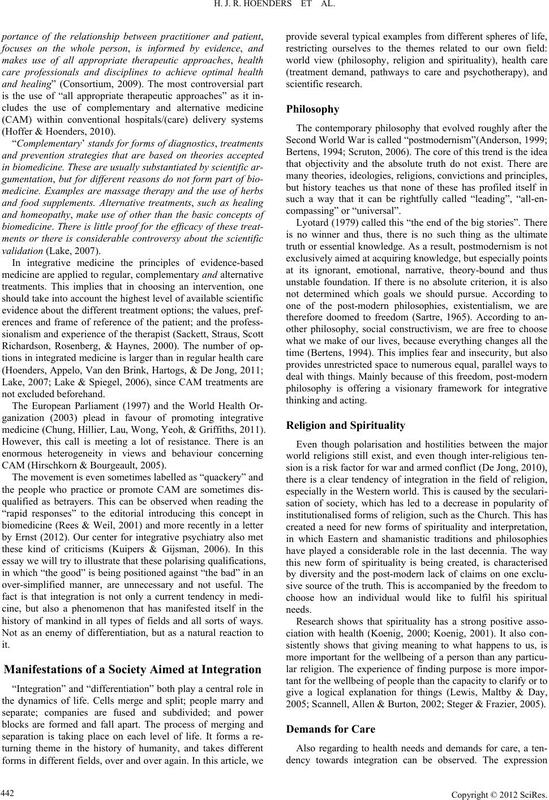 Social Science & Medicine, 62, 2973-2987.
and Complementary Medicine, 4, 123-126. Kabat-Zinn, J. (2003). Mindfulness Based Stress Reduction (MBSR). Constructivism in the Human Sciences, 8, 73-83.
tients. 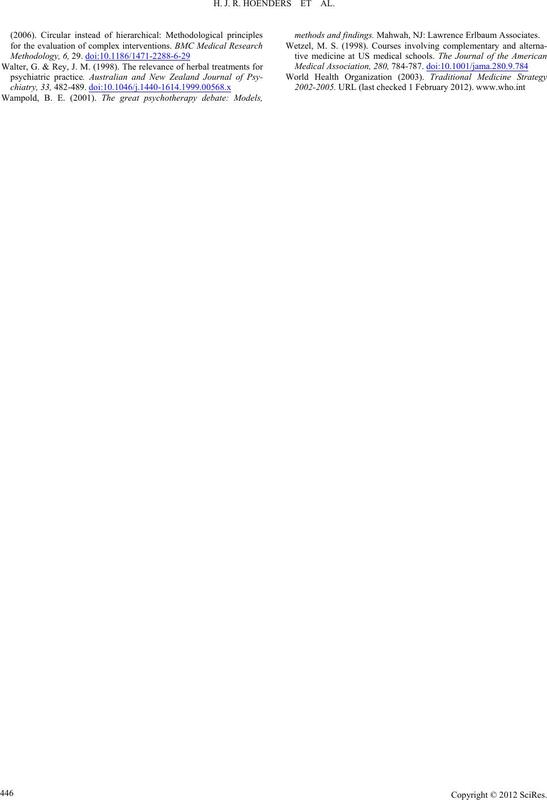 The Journal of Nervous and Mental Di sea se, 187, 692-695.
to clinical practice. JAMA, 284, 1708-1709.
behavioural therapy [Geïntegreerde cognitieve gedragstherapie]. baas is in het brein]. Am ste rdam: Bert Bakker. Luborsky, L., Rosenthal, R., Diguer, L., Andrusyna, T. P., Berman, J.
mostly. Clinical Psychology: Science and Practice, 9, 2-12. Ottenbacher, K. J., & Hinderer, S. R. (2001). Evidence-based practice. 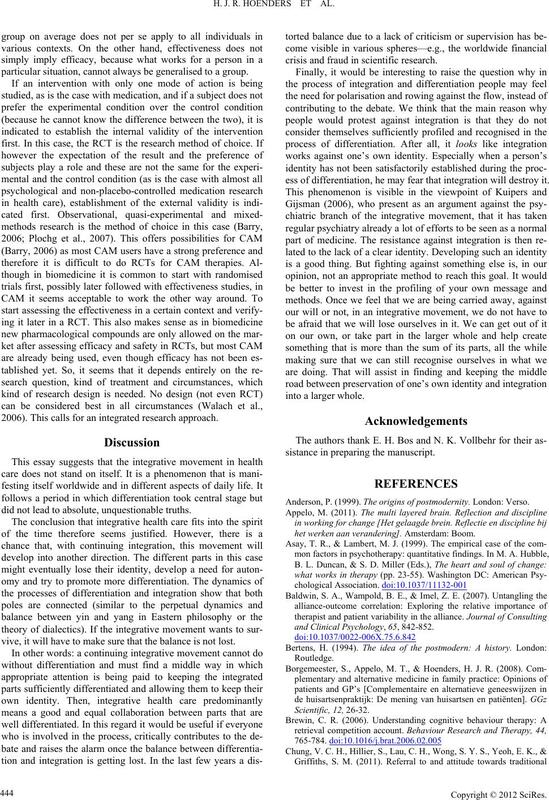 Journal of Physical Medical Rehabilitation, 8 0, 786-796. Plochg, T., Juttmann, R. E., Klazinga, N. S., & Mackenbach, J. P.
zorgonderzoek]. Houten: Bohn Stafleu van Loghum. Rees, L. & Weil, A. (2001). Integrated medicine. BMJ, 322, 119.
un humanisme]. Paris: Les Editions Nagel. approach. Edinburgh: Mosby, by Hartcourt Pu blish ers Limited. population. Alternativ e Therapies in Health and Medici n e , 5, 71-76. 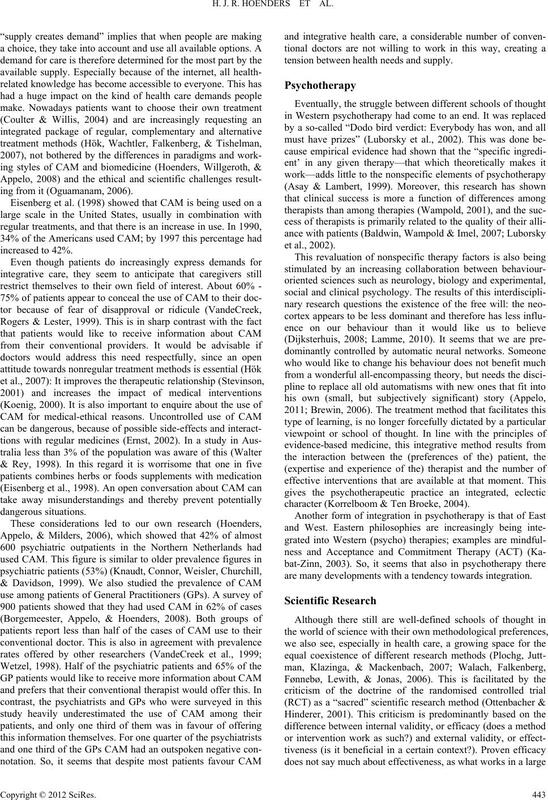 Walach, H., Falkenberg, T., Fønnebø, V., Lewith, G., & Jonas, W. B.
methods and findings. Mahwah, NJ: Lawrence Erlbaum Associates.